Spiraling is a New Jersey-based pop-rock quartet. The band was formed out of a previous incarnation called "You Were Spiraling" by keyboardist/vocalist Tom Brislin. Spiraling gained national exposure with its self-produced independent release Transmitter. Critical and popular response to the album was enthusiastic. The Star-Ledger of Newark hailed, "There isn't a dull moment on the band's self-released, immaculately produced debut album Transmitter." It also attracted the attention of The New York Times, among a host of other national publications. 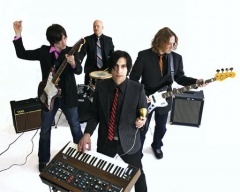 It is difficult to pigeonhole the group's dynamic, synth-infused modern rock sound. The band has performed with marquee acts such as OK Go, They Might Be Giants, Violent Femmes, and Rooney at various venues. Brislin has toured with progressive-rock legends Yes, as well as behind the operatic-rock of Meat Loaf, holding his own with these music veterans and gaining acceptance from both acts' devoted followings. This page was last modified on 13 February 2010, at 17:37.